After many months of work, we are proud to present our collection of Public Defender TV classics. These shows were transferred from original assets and are not copies of any other previously released versions. Public Defender Vol. 1 includes thirty beautiful quality episodes in a 6 DVD set. You will also find Public Defender Vol. 2 is available. Yes, we know some of these shows are available for download or can be viewed on YouTube. But the quality of most of these is nasty. Our collection includes nice quality film transfers. For more information or to order these rare TV classics, visit MyVideoClassics.com. Reed Hadley stars as Bart Matthews, Public Defender, who defends the poor and others who cannot afford an attorney. All episodes are based on actual cases from across the country. When this series was created, the concept of the public defender was little known in the United States except in capital cases. The series aired on CBS from March 11, 1954 to June 23, 1955. The series was filmed by Hal Roach Studios in Culver City, California. 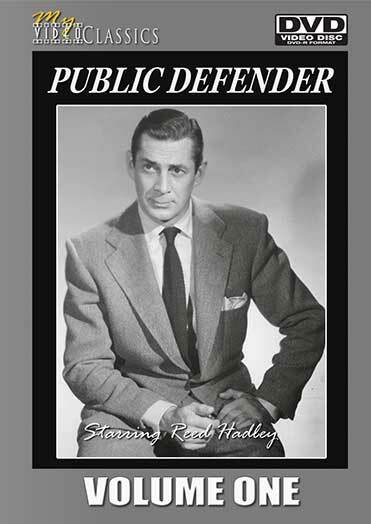 The Public Defender originally aired at 10 pm ET. Reed Hadley later starred in another classic TV show, RACKET SQUAD. This entry was posted in Nostalgia Merchant and tagged attorney, Classic TV Shows, crime, detective.